Cops and robbers…and zombies! Oh my! 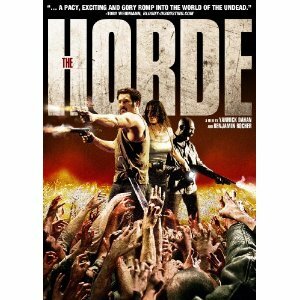 The 2009 French zombie film The Horde gives a whole new meaning to “The Good, the Bad and the Ugly”! However, the concept of good guys and bad guys facing the added complications of a horde of zombies isn’t totally new—after all, I wrote an entire blog about zombie prison films! 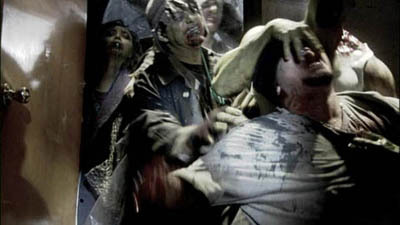 But in actuality, The Horde most closely resembles one of my favorite low-budget zombie films, Gangs of the Dead from 2006. The Horde begins with a funeral (nope, no zombies yet), after which the family of cops goes vigilante to get the gang who killed one of their own. 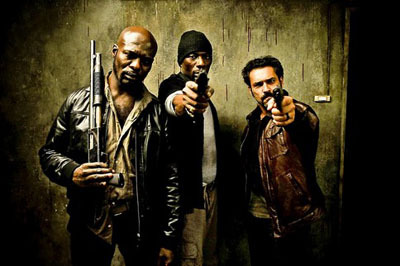 The gang and the cops end up trapped in a high rise in the projects as a result of an unexplained zombie outbreak (the only hint of its origin being some sort of fire in the sky). This is one gritty and violent film, with no room for apologies from any of the characters. The cops and the gang members are all stubborn in their feelings towards each other. The leader of the gang is one serious looking black bald mofo with cool lamb chops, whose younger brother is a bit resentful of his controlling behavior. It doesn’t help that a pimpish looking white dude in the gang instigates the younger brother’s resentment. Meanwhile, the standouts on the cop side include one female who is out for revenge because the gang killed her lover and the male hero, who can pretty much be described as a super Mario brother who has been hitting the gym a bit. The zombie action comes on fast and furious—and the cops and gang members don’t hesitate to accept that these are the undead and that all rules from living dead movies should apply. The first zombie has a whole Resident Evil Nemesis vibe, and it feels just like a boss battle! In fact, much of this movie reminds me of a video game. There’s an entire fight scene that is handled with nothing more than a knife, giving me bad flashbacks of Resident Evil games when you’re out of health and bullets, dragging your body down a dark mansion hall, and are forced to fend off the undead with just the knife. Eek! Meanwhile, this crazy old dude with a pickaxe who seems to be off his rocker and may turn on the other survivors at any second is like something you’d see in a “psycho battle” in one of the Dead Rising games. Of course, there are some traditional zombie film plot devices. Loyalties are switched, characters make costly mistakes, a hero is bitten, and there’s the moral dilemma of taking out a bitten loved one. Also, the usual demonstration of humanity being just as vile as the zombies is brought to a whole new level of disturbing. The zombie abuse is so repulsive I was ready to start a zombie advocacy group! It was also jarring having a crazy old man calling the zombies “chinks” (in the dubbed version). I didn’t quite understand what that was supposed to mean—maybe it’s a French term, but it just sounds wrong every time he says it. And finally, I have to give props to this film for featuring one of the most unlikable heroes in zombie film history—the type of despicable behavior and personality traits that are usually reserved for the loathsome character that eventually dies a vile death that completely satisfies viewers. And if you watch the deleted scenes, you realize the character would have been even more detestable if the scenes had been left in the film. One last thing to note about The Horde. I have to say, the actors doing the dialogue in the English dub are superb. It genuinely feels like the actors on screen are speaking the lines. Three years before The Horde was made, another film hit the DVD market called Gangs of the Dead (aka: Last Rites). In this film, two gangs and a group of cops end up in an old warehouse together after a meteor hits a homeless preacher and his followers, causing them to give into sins of the flesh—eating flesh, that is! When this film begins, you may feel like you’re going to get a cheesy, laughable film like Leprechaun in the Hood. There’s some humor indeed, and actually it is sprinkled throughout the film, but the truth is, this is a pretty serious zombie film. The humor doesn’t get in the way or feel out of place. Because of its low-budget, Gangs of the Dead of course gets completely trashed. I, naturally, love it. I think it has a lot going for it. The setting is great and the director makes perfect use of the ventilation fans in the warehouse and the kind of strobe light effect they create in the dark building as they spin, continuously blocking and revealing the light from outside. If zombie makeup effects are lacking at all, it is carefully disguised by camera angles and editing, because they look pretty damn frightening to me. And the gore is top notch, with a climactic body-shredding scene that is right up there with something Savini would do for one of the Living Dead films. Just as in The Horde, the cops and the gang members aren’t exactly friends here. In fact, they are even less willing to cooperate with each other. While there was only one chick in The Horde, this film features a whopping two! And just like in The Horde, the leader of the gang in this film has a younger brother and their relationship is challenged by the zombie outbreak. The crazy old man in this film, if you want to call him that, is actor Reggie Bannister, better known as, well, Reggie from the Phantasm films! Quite honestly, I couldn’t help but notice the similarities between the ending of this film and The Horde. Wait! Is The Horde just a European remake of Gangs of the Dead??? Gangs of the Dead isn’t trying to be anything smart or thought provoking. It’s an all out zombie action flick, and delivers on all counts. Definitely one of the better low-budget zombie films to watch while you’re in-between the “high art” zombie films and mainstream zombie films by which every other zombie film is judged. Of course, if you watch The Horde and then watch Gangs of the Dead, you’re going to curse me for comparing these two movies in the same blog post. Just remember the source—a guy who thinks Grease 2 is one of the best musicals EVER…. This entry was posted in Movie Times & Television Schedules - Staying Entertained, The Evil of the Thriller - Everything Horror and tagged Gangs of the Dead, living dead, Reggie Bannister, The Horde, undead, Zombies. Bookmark the permalink. 1 Response to Cops and robbers…and zombies! Oh my!